HCM CITY (VNS) — HCM City authorities planned to finish fortifying the city against floods before the season began, but the deadline is looming and preparations aren't complete. Despite efforts to prevent flooding over the years, 22 different areas flooded last year because of water blockages in canal projects, the negative impacts of climate change and heavy rain, and other natural causes, according to the Steering Committee for Flood Control. The committee added that the city would only be able to fortify 61 of 68 flood-prone areas this year. Apart from measures like canal dredging, building a network of tidal sluices could help eliminate urban flooding, the committee said. Prime Minister Nguyen Tan Dung approved a major plan for the network in 2008, in which 13 tidal sluices in Tay Ninh, Long An and HCM City would act as gates preventing tidal river water from flowing into populated areas. Seven years later, only one sluice - Nhieu Loc–Thi Nghe in HCM City - has been finished. A funding shortage stopped the others short, despite a VND23-trillion (US$109.5-million) budget approved by the city administration. The allocated funds might not be enough, said Ho Long Phi, director of the Water Management and Climate Change Centre. "The tidal sluice plan should be divided to smaller parts and focus first on hotspots like in Districts 7, 8 and Thu Duc," Phi said. 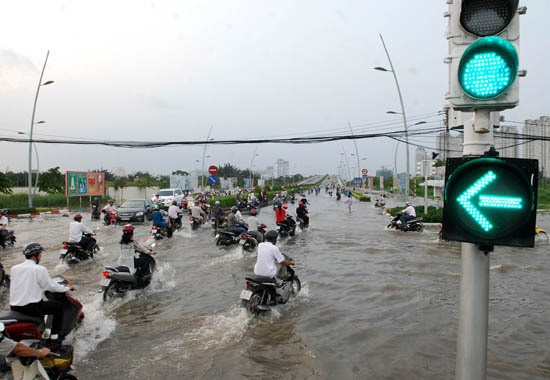 HCM City has struggled to solve its flooding problems for decades. The city created the issues itself when it bulldozed several canals to make room for more houses and roads, said Le Huy Ba, a professor at the HCM University of Industry. "The clearance of canals might help to develop the city, but the consequences were very serious," he said. Authorities tried to replace the canals with underground drainage, but they had about a tenth of the canals' waste water capacity and often clogged with soil and trash, Ba said.